Since we received two bucketfuls of green tomatoes, I’ve been scanning the web to learn about what you can do with them. I learned that tomato gardeners pay careful attention to the frosts. They leave their tomatoes on the vines until a big frost is predicted (sometimes called the killing frost). When a killing frost is expected, they quickly harvest their tomatoes—it doesn’t matter if they’re green, pink or red. They rescue the tomatoes just in time. Imagine being a tomato and having no control over when you’ll be taken in by your gardener. As it keeps getting chillier and chillier, the tomatoes may be saying, “Rescue me please, it’s getting cold!” Little do they know that what awaits them in the warm house is a sharp knife and a hot oven. My mother-in-law mentioned that she has heard of green tomato pie and that supposedly it tastes like apple pie. I found this recipe from blogger Alanna Kellogg of A Veggie Venture. I made this pie crust, which was recommended in the recipe. I made a few adjustments to the recipes. First, I chilled the bowls I used for making the pie crust. Steve, my baking husband, suggested I do this, and I think it made the dough easier to work with. Also, I poured off most of the liquid that formed when the tomatoes were ‘marinating’ in the cinnamon and sugar. Pouring off most of this liquid before putting the tomatoes in the pie was a good move because otherwise I think the pie filling would have been too runny. Not only did my customer rescue the green tomatoes from her garden, this pie rescued me by being really good. You see, I’ve had more than a few cooking and baking failures (chocolate chip cookies that resemble charcoal briquettes, anyone?). So it was exciting to have a baking success! Rescue Me Pie tasted very good; everyone who had a slice agreed that it might even be better than apple pie(!). Even though I’ve set off the fire alarm more times than I’d like to admit, I do have some pie crust experience. As a little girl, I would sit in the kitchen while my mom made pie crust. She’d talk about what she was doing, “it doesn’t matter if it seems crumbly, you have to patch it together.” She’d give me bits of pie crust dough and like a little mouse I’d nibble them up. 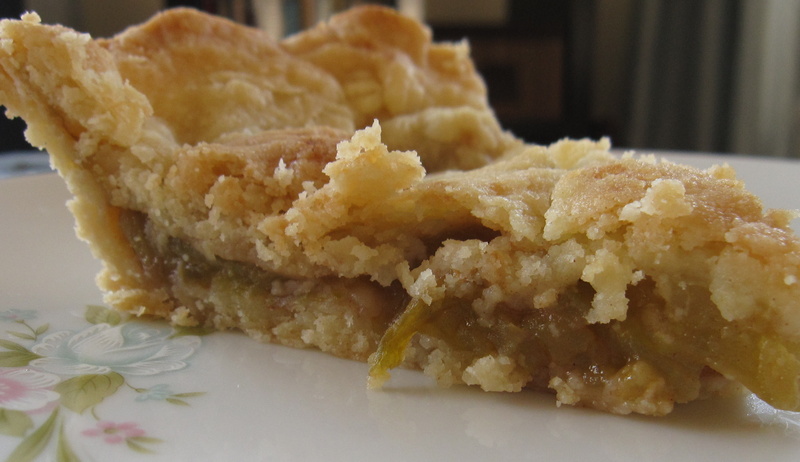 Green tomato pie is tasty and as easy as apple pie. It tastes like it too, which makes me wonder, can most things taste like apples with some cinnamon and sugar? 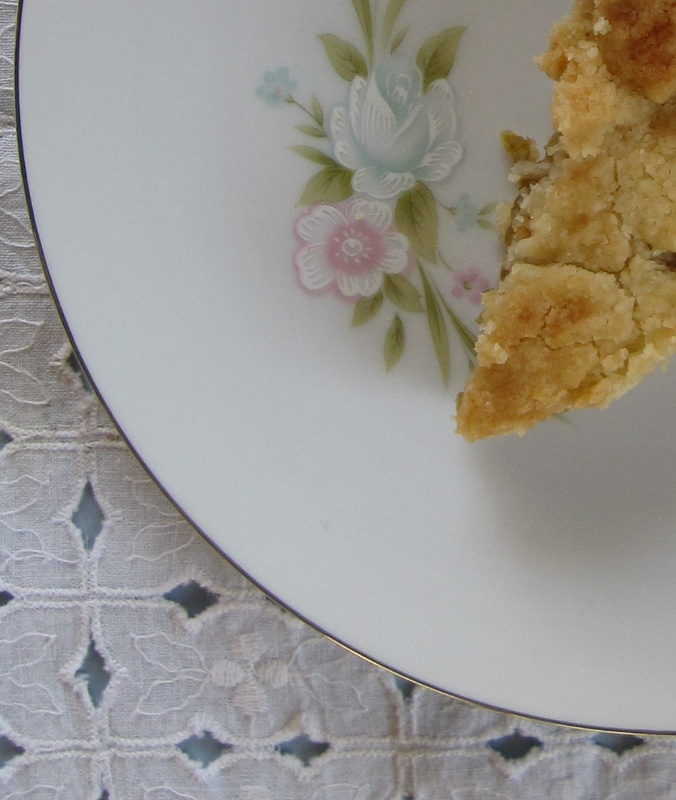 Have you ever tasted a green tomato pie? If not, are you willing to give it a try?